This program is a part of our Practical Guide to NLP series. What that means is that you are getting the goods presented in a very simple, straightforward manner so that you can be applying it in your life ASAP. No longwinded ramblings, just short, concise, powerful info installed directly into your brain for instant application. People paid thousands to attend this training – but it wasn’t open to the public. 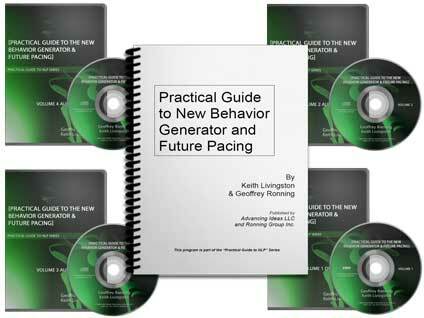 In this segment, Keith Livingston reveals ultra effective NLP New Behavior Generator and Future Pacing techniques. You’ll get to see and hear as Keith guides you through the intricacies of the power of creating a turbo-charged, dynamic roadmap for the unconscious – so you are effortlessly and automatically motivated to do the things that help you accomplish your goals. In fact, you can watch as Keith turns beginning stage hypnotists (most of whom had never stepped on stage) into self-assured, self-motivated dynamos with green beret confidence! You can use these same techniques to create confidence in your life. 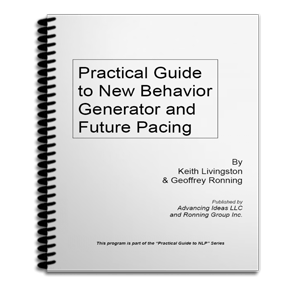 You get an exciting live presentation of Keith Livingston teaching the New Behavior Generator and see all the nuances that make this technique so powerful. You will learn all the ways that Keith has turbo charged this strategy and added fuel to fire to make this sucker hum! You learn all the little additional components that will blow your mind and give you power to make changes in your life and others. The workbook contains complete transcripts of the interviews PLUS exercises designed to get out and use the skills. Follow through with the exercises and you’ll be a new behavior generating guru in no time. 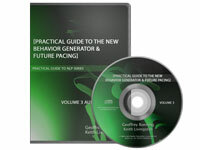 Order today and start busting those habits and creating the new behaviors you desire in yourself and others. Shipped to your door. One DVD, three audio CDs and a workbook.